A little project of mine I was looking at setting up next year if it is possible a long range wifi network around 250M at the most. Just wanting any tips from anyone that has good knowledge on it. Details of location and things in the way below. The two buildings I want to have wifi coverage is b1 and b2, b3 will be a bonus. 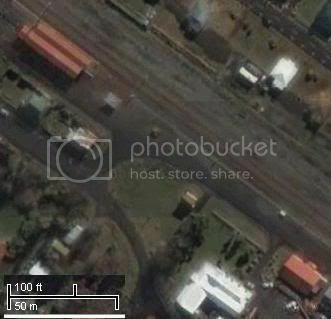 Below is a google maps shot of the area with measurment. Another problem is that a railway line goes past here that has overhead wires at a voltage of 25kva. If its any help, I live about 200m from a railway line and I know that a work colleague has tried to connect to my wireless router and succeeded whilst sitting in the train that was stationary at the station. I use a very standard WAG54GP2 with the default internal antenna. I suspect that all you will really need for this setup is a good wireless router and an outdoor antenna. That will extend the range probably enough to give the other buildings reasonable coverage. If your providing say ADSL to the other buildings, the best speed you will get from the ADSL line is around 3mb/s. So a Wireless N device will easily out perform that even at its maximum range. However if you are trying to provide Media over that connection it could be patchy. Just google for outdoor wireless antenna's or check the dynalink.co.nz site for antenna boosters if the signal level is too low. Considering its all line of site, an outdoor antenna for the wireless router can achieve quite useful results. Was going through my forum topics and I thought I should update this one. I found a good solution at www.gowifi.co.nz with two UBNT Nanostation M routers which have a range of up to 15km. After walking around town it seems they are used alot in Ohakune for making money from wifi hotspots. They have a secondary port on them as well with POE pass though if you need it to fire off to another spot or have more than one in the same place. Have since used them for connecting buildings that the network between them has broken to get things going until the link has been fixed and in one case the secondary port on the receiving router has a webcam plugged into it. Given the distances involved you'd get away with Nano Locos rather than Nanos. Locos are cheaper, the trade off is less distance but for 250M I wouldn't be concerned about that. Use 5Ghz equipment rather than 2Ghz, especially if this network is in town. The 2Ghz spectrum is getting crowded. BTW 15Km is VERY aspirational. Less than 5Km is typical for this model of equipment and 1KM(ish) for Locos. 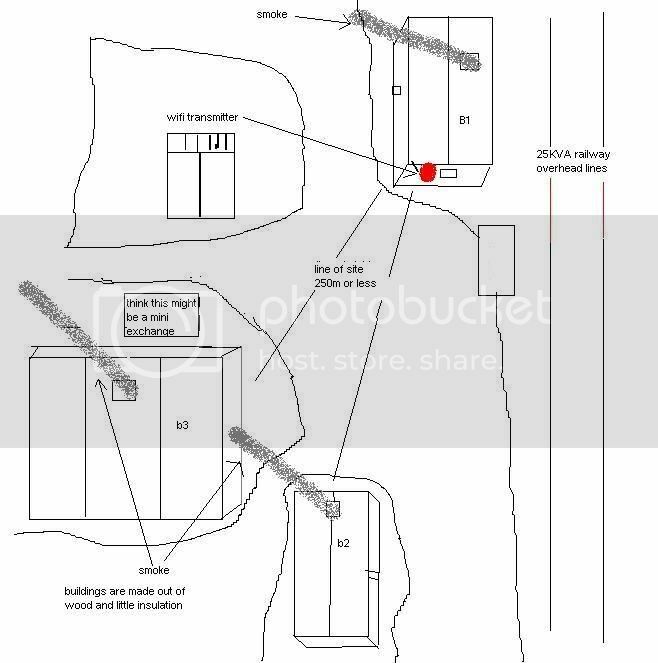 If B2 is the access point end ( ie the other two buildings contain equipment that is dependent on equipment, perhaps a server or router in B2) then I think you should be fine with a Nano Loco on each building. if B1 has to be the access point end, can you get the station on B3 above the trees? if not consider two bridges, one from B1 to B2, and one from B2 to B3. I wouldn't consider an external antennae for a domestic wireless router. There's likely to be far too much loss in the antennae cable for it to be practical. By the time you buy a good quality directional external antennae and install it, you might as well buy Nano equipment and do the job properly. Also, properly set up in your proposed network, the Ubiquiti bridges will shift data faster than you can pull it down off your ADSL connection. Oh.. also, the secondary ethernet ports on the Nano M series equipment only work reliably with certain types of firmware. Don't rely on using them, they're unlikely to be much use to you. gwh: Oh.. also, the secondary ethernet ports on the Nano M series equipment only work reliably with certain types of firmware. Don't rely on using them, they're unlikely to be much use to you. The ethernet passthru works well, it's purely the PoE passthru that has experienced issues on some earlier hardware and firmware releases. I have not used the POE pass through yet but a project I am doing when I am back in the country it would save running muitply cables just for POE. I will check the firmware on the ones I currently have but before I deploy them I usually update them to the latest firmware anyway. i was previously using them to connect a network to a place 2KM down the road and we were just using the 5GHz Frequency due to the saturation of the 2.5ghz Frequency in the town and it worked a treat even with trees in the way and the snow we got did not break the signal either. I will probably use the full size ones over the mini ones (because we have a few of them already) to connect 3 of our buildings together which are up to 1km apart and the middle building what is not the main building is the only one that has line of sight of both buildings so on one of the routers it would be preferable to have the one cable running up to it from the POE and the secondary port going to the second router that goes to the 3rd building. It will all come out in the testing but if I have problems I can call the Gowifi team for recommendation's. The title of the thread got me excited, thinking you were maybe trying for 20km or more. Skolink: The title of the thread got me excited, thinking you were maybe trying for 20km or more. The longest range wifi device that we currently use is around that distance maybe a bit longer using a ubnt bullet and a mesh antenna. what goes to a webcam that overlooks Ohakune. Not WiFi as such, but claims to create a wireless ethernet connection up to 40 miles. I'm looking at using them on one or more projects so may get a pair for testing in the not-to-distant future. In another thread I started recently, it was mentioned that the secondary Ethernet port was bridged, and thus inaccessible when using the Nano M series in the most commonly used VLAN mode. Were you using the Nano M series in "Router" mode Steve? If so, were you able to assign the secondary Ethernet port its own IP address, and how difficult was that to set up? The secondary port is bridged to the main port. VLAN support is very limited in the current 5.3.x AirOS software. V5.x betas which I've been playing with for months have far better VLAN support. sbiddle: The secondary port is bridged to the main port. So if I wanted to access the secondary port independently from the main port, how would I go about it? If the two ports are bridged together, is this even possible? in the weekend and without much effort to align the antennae got 12Mbits/sec over a 1.4km link. That included a bit of the neighbours roof in the path at one end, and trees in the way at the other. Will be playing further in the next week or two and am hoping we might squeeze a few more dB out of the link by raising the antenna above the trees at one end, which will hopefully enable 54Mbits/sec. ... in the weekend for a 1.4km link and got a reported link speed that varied between 60 Mbps and 90 Mbps. I've no reason to doubt these figures, as standard definition video streamed perfectly although it wouldn't quite do HD. Receiving signal strength was -66dB which was way better than the previous test (see previous post) where it was more like -90dB, probably due to better positioning of one of the antennae. This set-up will be left in place, so it will be interesting to see how it stands up to the elements as I'd have to say that the units look only marginally weatherproof.